Non-marital childbearing is associated with many adverse outcomes for both the mother and the child. Most of these births are unintended. If we could reduce these unintended births it might improve children’s prospects by enabling their mothers to get more education, earn more, and wait to have children within marriage. In this brief, we trace the effects of reducing unintended childbearing on children’s success later in life by using the Social Genome Model (SGM) to simulate the effect on children’s life chances of aligning women’s fertility behavior with their intentions. Though the impacts of improving women’s control over their fertility are small for the population as a whole, there are significant and important improvements in the lives of children who would have otherwise been “born too soon.” These findings suggest that increasing access to and awareness of high-quality, easy-to-use contraception and improving the educational and labor market prospects of low-income women are important steps in improving children’s life chances. Unintended pregnancy is a growing problem in the United States and accounts for the majority of births to single mothers. The term “unintended” is derived from the National Survey of Family Growth (NSFG) which asks women to characterize retrospectively the intentionality of all of their previous pregnancies at the time they learned they were pregnant. If a woman describes the pregnancy as unintended, she is then asked if the pregnancy was mistimed (that is, came earlier or later than the woman desired) or unwanted (that is, she never wanted the pregnancy to happen). About half of all pregnancies in the US are unintended and around seven-in-ten pregnancies to unmarried women under the age of 30 are unintended. Less educated, poor, and minority women all have particularly high rates of unintended pregnancy (see Figure 1). Not all pregnancies are carried to term, of course. Almost half result in miscarriages or are aborted. 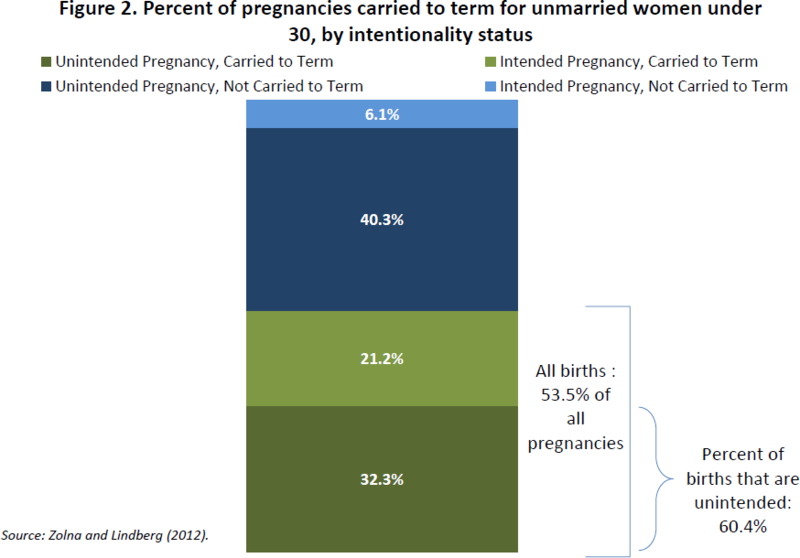 But among births to single women under the age of 30, 60 percent are unintended (see Figure 2). Less-advantaged women are, in addition to being more likely to have an unintended pregnancy, also more likely to carry an unintended pregnancy to term. As a result, unintended births as well as pregnancies are much more common among less advantaged women. A key cause of the rising number of unintended pregnancies and births is inconsistent and incorrect use of contraception. Though many types of birth control are widely available, many couples who claim they do not want to have a child do not use birth control regularly or correctly. There are many reasons for this – misinformation and myths about contraception and its side effects, the cost of the most effective forms of birth control, and human error. Of those who do use contraception, many people do not use the most effective methods. Among sexually active women aged 20-24, about 3 percent use intrauterine devices (IUDs), 27 percent use the pill, 7 percent use another hormonal method, and 15 percent rely on condoms. These methods have low failure rates when used perfectly, but, alas, humans are imperfect. Condoms require a couple to remember to use one in the moment, the pill must be taken every day, and prescriptions must be refilled on a regular basis. Long-acting reversible contraception (LARCs) such as IUDs and implants have particularly low failure rates in large measure because they are more likely to be used consistently than other methods. The CHOICE Project in St. Louis, which provided free contraception and counseling on the efficacy of different methods, found that the risk of contraception failure was twenty times higher among users of the pill, transdermal ring, and hormonal patch than among LARC users. The advantage of a LARC is that it changes the default from getting pregnant unless you work hard to avoid it to not getting pregnant unless you take a deliberate action to do so.